Aluminium Bench is a curved, twelve-metre long bench specially designed for The Sainsbury Gallery by industrial designer Jonathan Olivares, responding to the architecture and installations on display. Aluminium Bench applies architectural manufacturing processes to the scale of furniture. It uses extrusions and a rolling process that metal fabricator Zahner has developed for complex, curvilinear building façades. 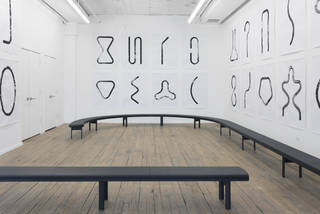 The bench was designed for Zahner’s web-based software platform ShopFloor, which combines generative algorithms and 3D software—a combination that has advanced architectural manufacturing—and results in a streamlined production of highly individualized shapes. ShopFloor allows the user to determine the curvature, length, and colour of the bench for specific architectural contexts. There is a minimum bend radius of approximately four feet, but beyond that any shape or length bench is possible. For The Sainsbury Gallery, a curved twelve-metre long bench follows the path taken by visitors through the gallery. Enjoy the Aluminium Bench as a resting place while you explore the architecture, light and sound works on display.